Policemen check the scene of an explosion on August 17, 2015 in Bangkok, Thailand. There’s been no claim of responsibility yet for the bombing in central Bangkok Monday, which killed at least 12 people but it’s clear the event marks a troubling new form of violence in a country that has seen it’s share of political turmoil in recent years. Thailand has been coping with two, mostly unrelated, ongoing political conflicts: an anti-government insurgency in the country’s predominantly Muslim southern region as well as a bitter and periodically violent feud between the two dominant political factions. 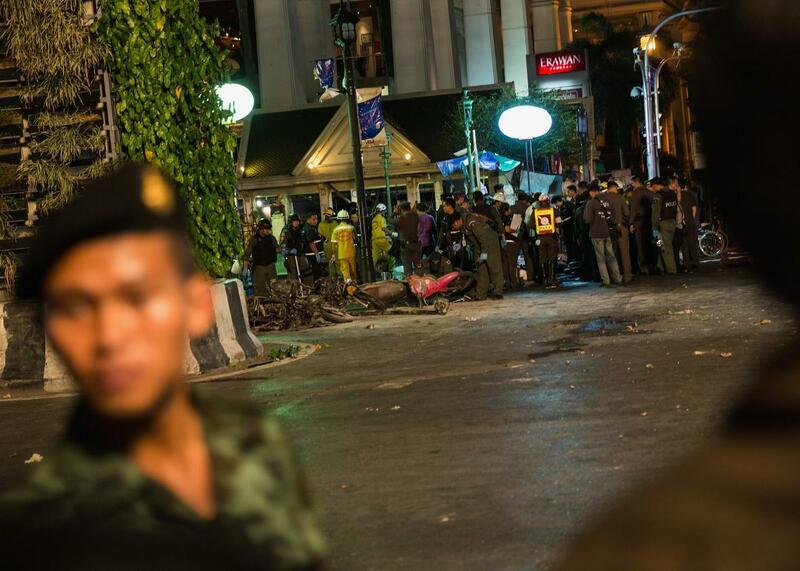 After Monday’s bombing, which has virtually no precedent in Bangkok, immediate attention has focused on the insurgency. Southeast Asia’s bloodiest ongoing conflict has worsened in recent months after a lull in violence last year. While there has been sporadic violence for decades, the current round began in 2004 and around 6,000 people have been killed since then. The insurgency is driven by resentment within the predominantly Muslim Malay ethnic group of Buddhist rule and what are seen by locals as efforts to promote Buddhism within the region. Violence has declined somewhat since the Thai government deployed over 60,000 troops to the south in 2007. Former Prime Minister Yingluck Shinawatra had tried to start peace talks with the insurgents in 2013, but that process stalled when she was overthrown in a coup in May of that year. The violence in this conflict has been almost exclusively limited to southern Thailand and usually consists of shootings or IED attacks against local authorities, the military, or Buddhist religious targets. On July 25, a Buddhist monk and a policeman were killed in a bombing by suspected Islamist insurgents in southern Pattani province. And another attack in southern Thailand killed four soldiers earlier in July. If Monday’s bombing turns out to be related, it will represent a turning point in the insurgency: an attack on civilians outside of the south, in Thailand’s capital. At the same time, Bangkok has been locked in an ongoing cycle of confrontation between the military-backed elite and supporters of Shinawatra and her elder brother Thaksin. A populist businessman popular among the country’s rural poor but despised by the urban middle class, Thaksin was elected prime minister in 2001 and overthrown by the military in 2006 and currently lives in exile, facing a number of criminal charges back home. Yingluck was elected in 2011, and overthrown herself in May 2013. Since then, Bangkok has seen repeated mass demonstrations by supporters of the two camps, referred to by their color-coordinated t-shirts. The largely urban “yellow shirts” support the military and the monarchy while the largely rural “red shirts” want to see the Shinawatras back in power. Confrontations between the red shirts and the military have often turned violent: At least 28 people died in street protests during the 2013 coup. What both the insurgency and the political standoff share is the threat posed to the Bangkok-based political elite by anger in less developed rural areas. Whoever carried it out, today’s unusual attack in the heart of the capital is a reminder of the dangerous fragility of the country’s political situation.